"Stories Gathered at the Kitchen Table" available on Kindle NOW! : Get the eBook version on Amazon today. Selected as Semi-Finalist for Eludia Award: Sweet Bye and Bye has been selected as a semi-finalist! This is the perfect companion to a Write Hot! Workshop or the perfect workbook for any at-home or individual writer. This indispensable guide includes fresh writing lessons, writing prompts, and inspiration for practice writing. Also, find some of Anne’s most famous recipes for soup! Divide your life into three parts. Jot down what YOU learned over the three stages of your life. Choose one success and write about it. 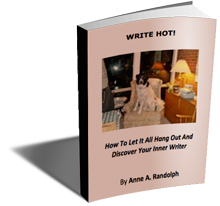 Get a taste for Kitchen Table Writing and start Writing Hot! Download a sample page from the workbook. Send Anne what you write, and she’ll send you a special gift for getting started! If you like these ideas, purchase the Write Hot! Workbook for only $15. Order Today. OK, I admit it. I really enjoyed Writing Naked! Anne has brought us a fun and apposite workshop that challenges us to switch off our internal editor and dig deep inside for hidden treasures that make our stories, and the people who populate them, jump to life. I’ve learned so much about writing through the openness and consistency of Anne’s workshop. The most wonderful work just pops out of my pen when I work from Anne’s prompts, in the trusting, supportive atmosphere she creates. Anne Randolph is my absolute favorite speaker and I’ve listened to quite a few! Her workshops are thought-provoking and creative and I can’t recommend them enough. I adore her workshops!